When you think of Vancouver, the first thing that comes to mind probably isn’t “city of glass and steel”, but that might be about to change. 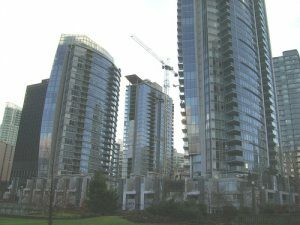 If you take a walk around Vancouver’s downtown core, you’re bound to notice that the skyline is filled with cranes and the ground is filled with large holes — marking yet another apartment or condo construction site. Your eyes aren’t deceiving you. There are currently 59 developments under construction in Greater Vancouver and another 106 in pre-construction. An article by Global BC wondered whether the Greater Vancouver area is becoming over-saturated with condos. Whether you’re a developer or future home owner, things are looking busy in Vancouver.